Oschadleus HD. 2012. Trapped! Weaver nests as death traps. Ornithological Observations 3: 38â€“43. Weaver nests are woven and sometimes loose loops may trap birds. More often threads used as nest material are the cause of trapping birds, including the threads used in non-woven nests, like those of Sociable Weavers. 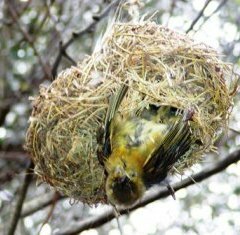 Several weaver species have been trapped in their own nests - literature references are provided. Non weaver species which became tangled were species that are closely associated with weavers: Diederick Cuckoos and Pygmy Falcons. Strangely, there is one record of a dead chameleon. New records of creatures trapped or tangled in weaver nests are illustrated with colour photos, for instance, the Cape Weaver nestling left. Read or download the pdf article here.